Ever wanted to disconnect from the modern world and get back to something a little simpler. 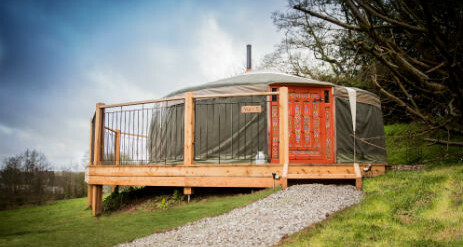 Why not try Glamping at Hidden Valley Yurts, located in Monmouthshire, Wales. Imagine a holiday where your children have the freedom to be children, a holiday where the night sky is so dark you can see the Milky Way and the only noises are a babbling brook and birdsong. 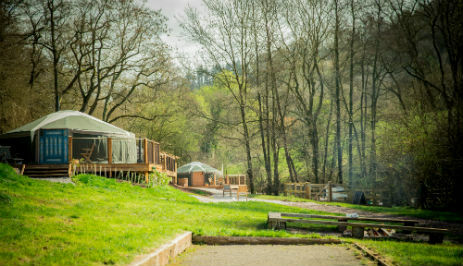 That’s what you’ll find at Hidden Valley Yurts set within the borders of Lower Glyn Farm, there’s a total of 80 acres of woodland and wildflower meadows to explore. You don’t even need to leave the valley if you don’t want to! 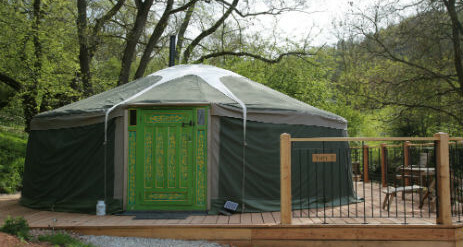 We are able to accommodate couples, families or groups in our 5 Mongolian Yurts that can sleep up to 7 people. All of which is set within the picturesque Wye Valley, an area of outstanding natural beauty. Children relish the opportunity to build dens in the woods, dam the stream and play on the rope swing, or for a quieter holiday you can relax on the large deck and cook pizzas in the wood-burning oven. There are more games than you could ever need (perfect for a rainy day) plus all the equipment you need for boules and badminton. There are miles of beautiful walks around the farm as well and the gently babbling brook running through the valley attracting kingfishers, herons and dippers, as well as a whole host of other wildlife. Be sure to pack your bug boxes and spotters’ guides for a Spring or Summer Watch special. For those that like to see the local area, there are, a wealth of activities such as mountain biking, canoeing, horse riding and climbing all within easy reach. For hill climbers the Black Mountains are just a 20-minute drive away. In a secluded valley, invisible to the outside world, our five Mongolian yurts stretch along the top of a beautiful, south-facing meadow alongside a stream and views to the west of the Welsh hills. There are no caravans, touring tents or holiday cottages at Hidden Valley, so there will only ever be a maximum of 31 people on site. Step through one of the brightly coloured doors of these innovative homes and you’ll find they are light, cosy and warm. 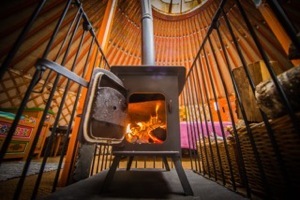 Lovingly decked out with beds, chairs, lights, rugs and wall-hangings each yurt is equipped with a wood-burning stove with kindling and wood for fuel. 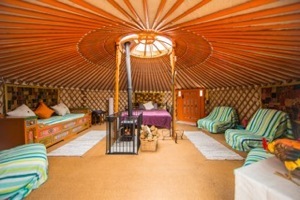 Inside the muffled confines of the sheep’s wool felt lining, each yurt feels intensely private. Comfortable and unique they entreat you to curl up and unwind, having spent the day wandering around the magical woodland, wildflower-peppered meadows and fields belonging to the farm’s 80 acres. Outside, you can relax on your own decking with ample seating and stunning views. A large communal kitchen and bathroom area boasts the kind of veranda that would make Gone With The-Wind type southerners jealous, and provides just the spot for whiling away evenings watching the sunset or playing a board game. King-size bed and a mix of daybeds and futons. Yurts 1,2 & 3 have super king-size beds. Pillows but no bedding, so you need to bring either a duvet and covers or a sleeping bag. We have a small number of duvets and bedding available to hire. Mix of furniture including some decorated Mongolian furniture, stools, chairs, coffee and side tables, throws, rugs and cushions. Wood burning stove. We supply enough kindling and wood for normal usage for the duration of your stay. Two power points for the electric lighting and to charge devices. Wooden deck, with chairs, tables, benches, a chiminea, a built in stone BBQ and a woodstore. Complimentary bottle of locally made apple juice from BC Bees Monmouthshire. 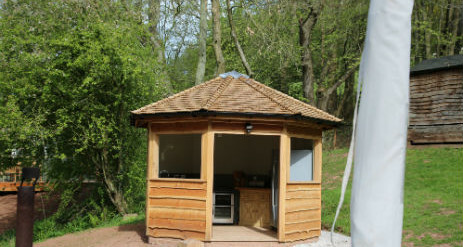 Each yurt has a smoke alarm, carbon monoxide detector, fire extinguisher and a fire notice. Please take the time to locate these upon arrival. Include a full size bath with shower over, separate shower, 2 flushing toilets. Yurts 1 and 2 have their own compost loos as well. Including full size stoves, dishwasher, microwave, crockery, cooking utensils, espresso machine(main communal kitchen) grind to jug coffee machine (yurt 1 kitchen, don’t forget to bring your beans). Guests have their own fridge and food cupboard. There is plenty of seating including 2 high chairs. 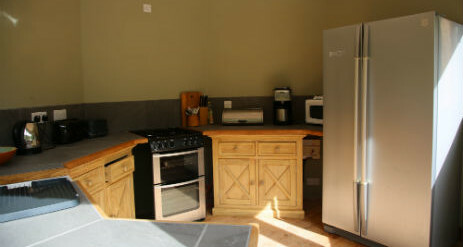 Yurt 1 has exclusive use of a separate kitchen (both fully equipped with everything you would need). Picnic benches, chairs and tables on the deck outside the kitchen. The pergola has a canvas cover which provides shelter from the rain and Safari style dining tent with 6m long table. Wood burning pizza oven. We even have a bread maker for you to make your own dough! Communal BBQs situated alongside the pizza oven. Communal camp fire is located in the centre of the field and we try and keep a stock of camp fire wood nearby but foraging for firewood in the woods is always encouraged (and great fun!). Chicken run which has 1/2 a dozen hens to provide fresh eggs for all our guests (within reason). Below the veranda there’s a boules pitch, badminton net and flat mowed area for games. There are also loads of board games provided and equipment for many other games. 80 ACRES OF WILDFLOWER MEADOWS AND WOODLAND Make dens, wander through the meadows, meet the Scottish highland cows, sheep, pony and our hens. Tilly the spaniel loves to show guests around too. There is nothing else – no gift shop, no vending machine, no washing machines and no tumble dyers. Hidden Valley Yurts is all about peace and quiet, playing and laughter – there are no TVs, computers or music provided, just the sound of the stream and the birds. We have a great pub a mile away and Monmouth, Chepstow, Usk and Raglan are all about a 15-20 minute drive away. The nearest little village shop is in Trelleck (3 miles away) and is perfect for your bare essentials. 6 miles away in Raglan there is an excellent ‘old school’ farm shop which sells local produce and fantastic beef (we absolutely love the rolled rib joint). 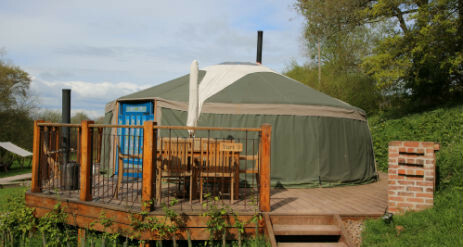 From £250 per Yurt for a 4 Night mid-week stay. 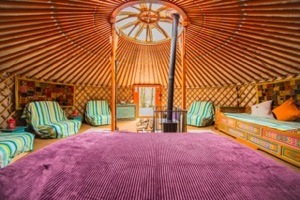 Prices vary dependant on yurt booked and season.